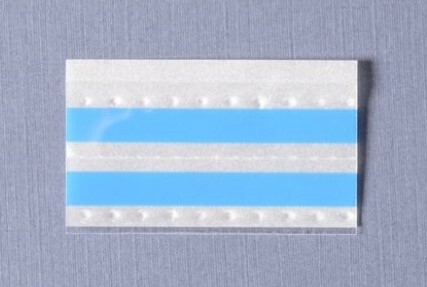 View cart “SR.124AB 24mm Double Edge Splice Tape (Blue & Silver)” has been added to your cart. Double splice tape can be used with either paper or plastic tape, punched or formed pockets, any cover tape, and come in a variety of widths. It is primarily used for splicing on-the-fly (no tools needed) without removing a tape feeder from the pick and place machine. Although this type of splice was designed primarily for punched tape, most customers use it for pocketed tape as well. It includes preformed dimples on the hard plastic cover for quick and easy alignment with the sprocket holes.